Very cool. 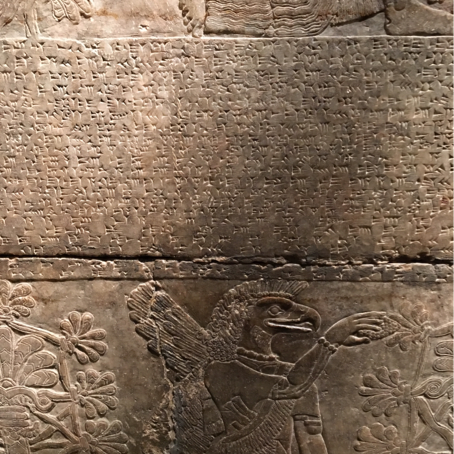 What does the cuneiform writing across this work say? It's known as the Standard Inscription and it glorifies the king by recounting his lineage and accomplishments including constructing the palace the panels come from. It begins like this: "The palace of Ashur-nasir-pal, chief-priest of Ashur, the chosen one of Enlil and Ninurta, the favorite of Anu and Dagan, the divine weapon of the Great Gods, the potent king, the king of the world, the king of Assyria, the son of Tukulti-Ninurta, the great king, the potent king, the king of the world, the king of Assyria"
What language is on these reliefs? Is it lost to us or can people today understand it? The writing system is called Cuneiform and the language itself is called Akkadian, language of diplomacy in the Near East for thousands of years. There are many scholars who can read Akkadian, but it is very difficult to learn. Would you like to see an translation? Ok. Yes, I'd like to know the gist of what it says! 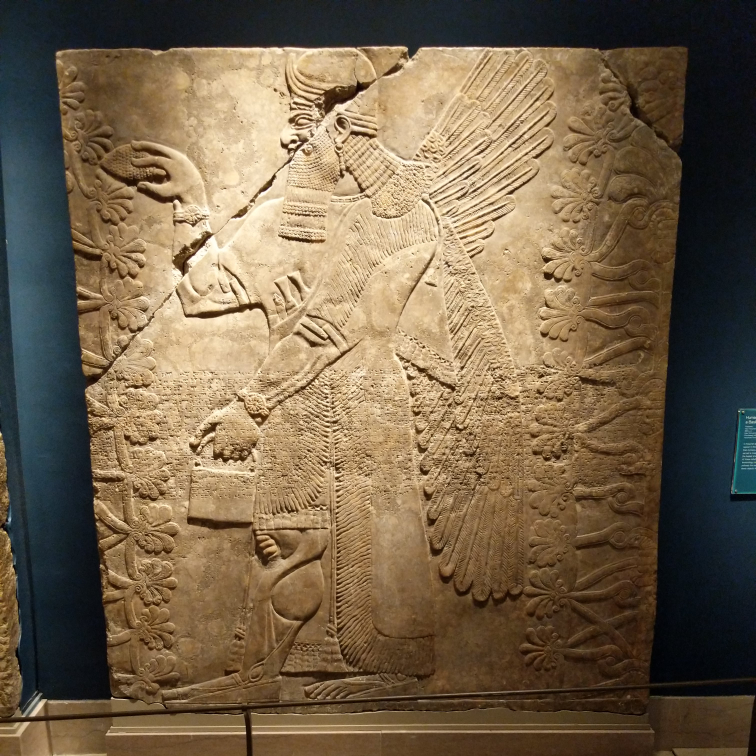 It glorifies the king, Ashurnasirpal II, and recounts his lineage and accomplishments including the construction of the palace that once housed these reliefs. It begins like this: "The palace of Ashur-nasir-pal, chief-priest of Ashur, the chosen one of Enlil and Ninurta, the favorite of Anu and Dagan, the divine weapon of the Great Gods, the potent king, the king of the world, the king of Assyria, the son of Tukulti-Ninurta, the great king, the potent king, the king of the world, the king of Assyria"
Cuneiform is a form of writing that was used in Mesopotamia starting around 3500 BCE and continued for thousands of years. The characters are formed from wedges and lines and stand for phonetic values and are actually highly stylized signs derived from pictograms that often vary from scribe to scribe. 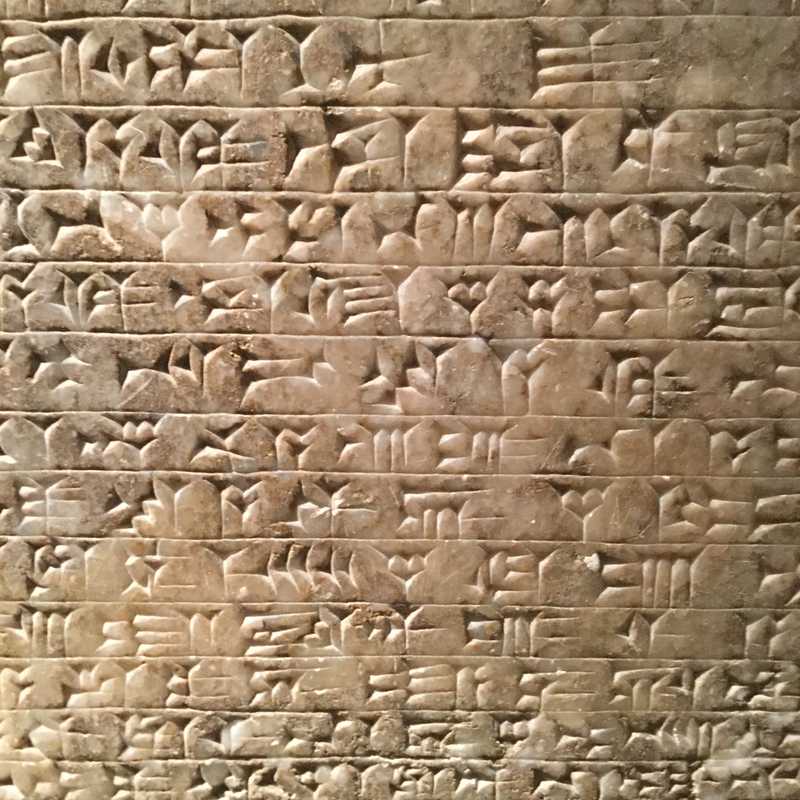 The wall reliefs in the Kevorkian Gallery here demonstrate Cuneiform used to write the Akkadian language. Akkadian was developed in the 3rd millennium BCE and was used as the language of diplomacy in Mesopotamia and the Near East until the Persian period. 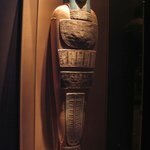 How do we know 69,574 people came to the festivities at king Ashurnasirpal in 879 BCE? That's a good question. There is actually an inscribed sandstone block from the period that describes the festivities in detail, called the Banquet Stele of Ashurnasirpal II. It records the ninth century Neo-Assyrian king's renovation of the city of Kalhu (modern-day Nimrud), which he made his capital. It boasts of the lavish palace and gardens he built, the restoration of temples, and the resettlement and rejuvenation of surrounding towns. Still odd that the number is so precise, isn't it? 69,574, not 70,000 or 69,575. Numbers were important business in ancient Assyria! It is not surprising that an exact count of the banquet guests was deemed necessary for official record. It's thought that writing developed in the region to keep count of livestock and business transactions. Numbers could get very high, very easily as their math was base-60. 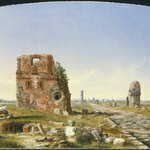 A fragment of that remains today in the form of the hour! 60 minutes. Could you please explain to me how these reliefs came to the United States? The Northwest Palace of Nimrud (modern day Kalhu, Iraq) was discovered in 1840 by an English diplomat named Austen Henry Layard. The region was part of the Ottoman Empire at the time. 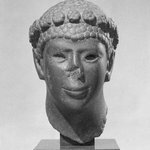 Layard began excavating in 1845 and the finds were so impressive that the British Museum, then engaged in a rivalry for Middle East antiquities with the Louvre, gave him two thousand pounds to send all the monumental sculptures and relief-decorated slabs he could. However, he sent so many that the museum could not house them all. Thus some went on sale. In 1855, Henry Stevens, an American living in London, purchased the twelve reliefs now in this gallery and sold them to the New-York Historical Society in Manhattan. 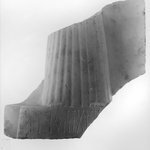 In 1937 the Society decided it could no longer house the slabs and lent them to The Brooklyn Museum, which eventually purchased them in 1955. How did they make these carvings in the stone? Also, did they draw on the stone first before carving? 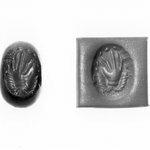 Producing these reliefs was a multi-step process that involved multiple individuals. First, a religious leader would draw the outlines of the figures and scenes. Then stone carvers created the relief you see today with chisels and abrasives. Next, a scribe would write the text that would later also be carved by stone carvers, who, themselves likely could not read. 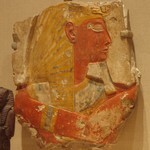 Finally, these reliefs would have been painted, but the pigment largely does not survive. The calf muscle design seems to be a repeated motif on the panels. Was this a process to repeat this design on purpose? Did they have a "standard design" for these? In general, the accentuated musculature in Mesopotamian depictions of rulers was a means of displaying qualities of ideal kingship. 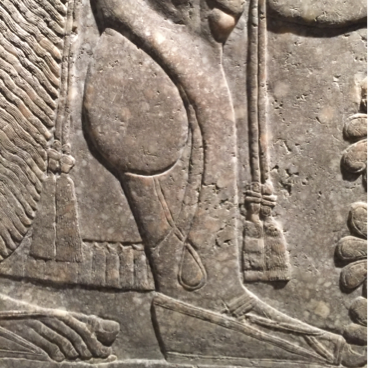 Assyrians wanted to be viewed as a warlike people accustomed to and adept at hard work and exercise so their art often exaggerates musculature, in this case the calf and that amazingly accentuated cutaneous vein below it. 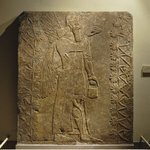 But these specific elements are definitely the most pronounced in these (and other) reliefs from King Ashur-nasir-pal II's Northwest Palace. Why is the text only in the middle of the block? The text band, which is the same inscription on each panel, was part of the decorative scheme. 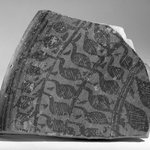 It was almost as if a giant cylinder seal, which was used in the region for a long time before and after, was rolled over the panels. At the time, reading wasn't very widespread and the writing system, cuneiform, is very complicated and takes years to learn. On one level, it's more about the idea of writing and the importance of seeing the text. The same inscription is repeated multiple times. 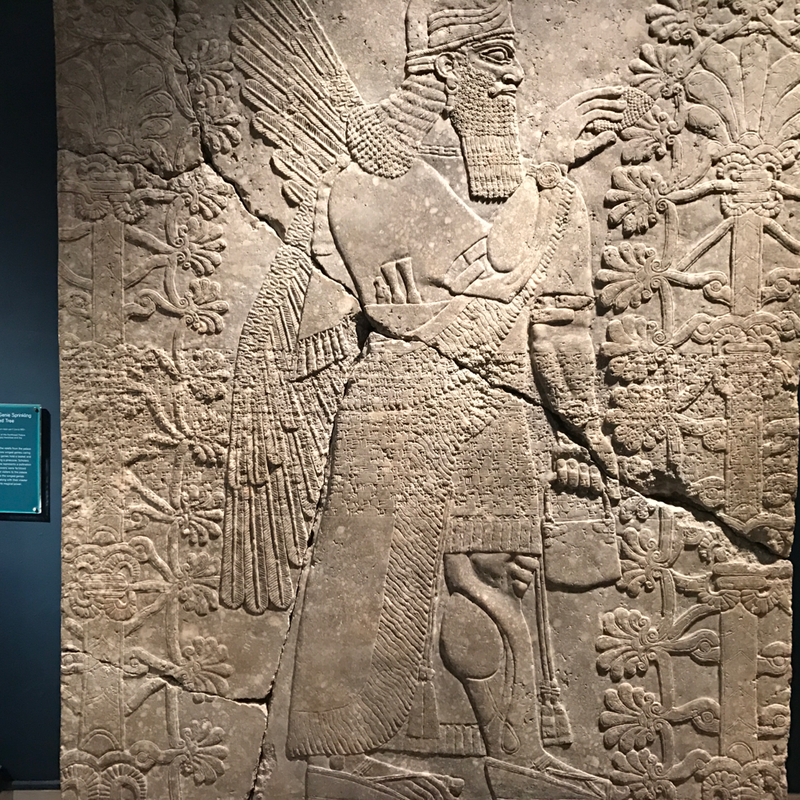 It traces the king's lineage and proclaims his victories, so the overall impression of those who saw the reliefs was supposed to be of Ashurnasirpal II's power as a king. 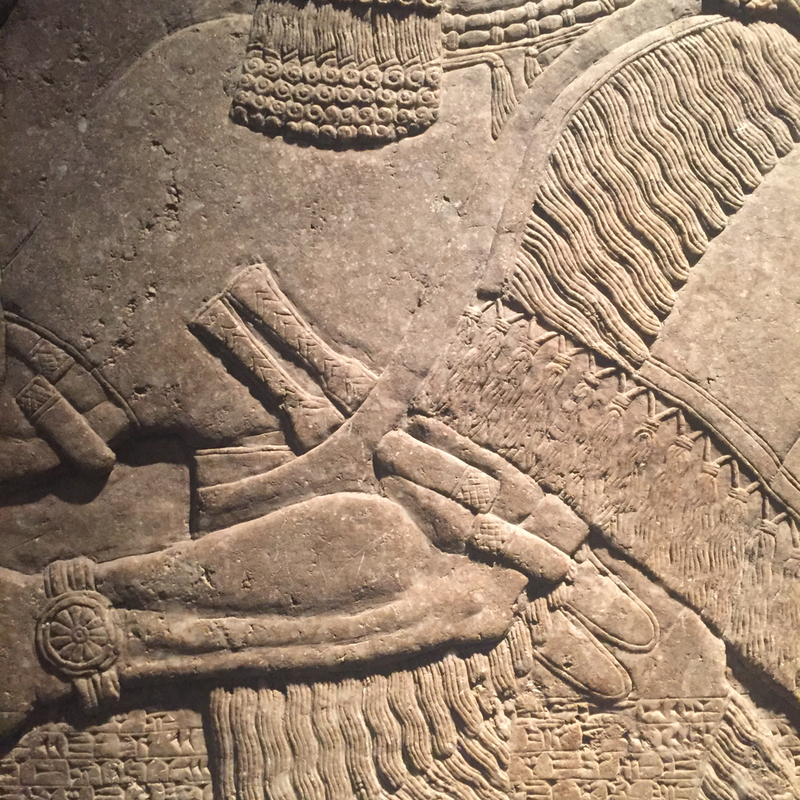 Do you know if there is a significance to the two knives carried by the figures in the Assyrian reliefs? Carrying two daggers was something that high-ranking Assyrian men did in real life, according to archaeology. 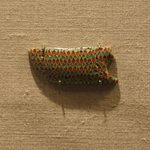 The types of decoration you see in some of the handles even matches inlaid decorations on real daggers that have been excavated. 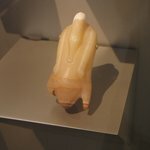 Some figures also carry a third object, a whetstone for sharpening their blades. Are the cracks in this work original? I'm not sure exactly when in its almost 3000 year history this stone cracked, but it was certainly a long time ago. 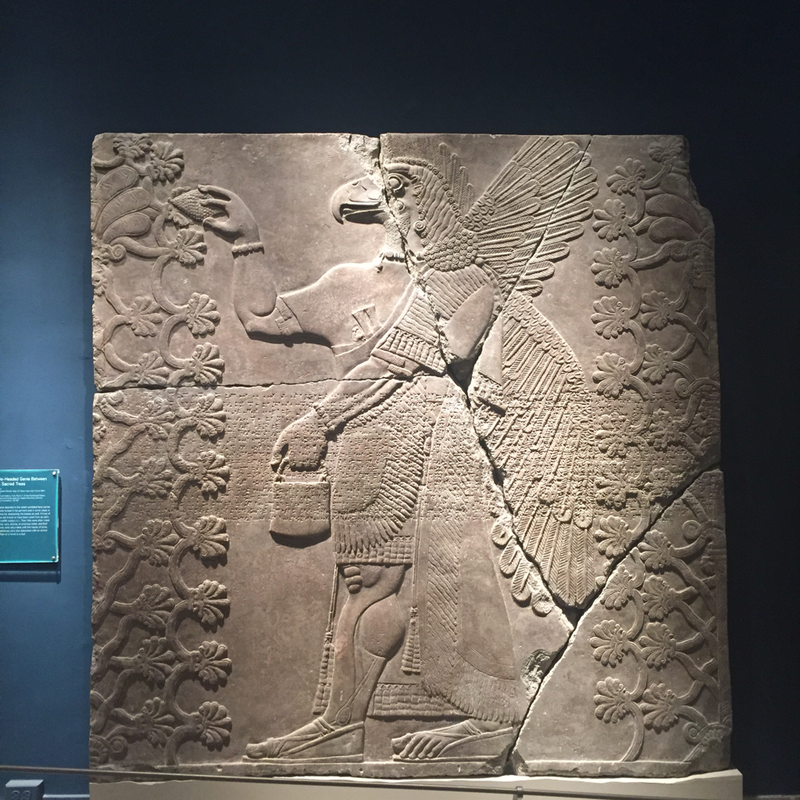 When these reliefs were originally installed in Ashurnasirpal II's palace they were undoubtedly un-cracked, smooth, and even painted. Since then, of course, the palace fell in to disrepair and was buried for thousands of years before being excavated in the late 19th century. 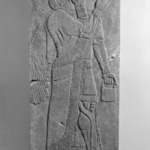 Then the reliefs were transported from their original location in modern-day Iraq to London to New York. So, there was lots of opportunity for such damage to occur. You can tell which cracks are the oldest by how worn they are. The lower right chunk of the block you sent a picture of was probably the first to break off, no doubt before the palace was rediscovered. What countries comprise what we now know as Assyria? 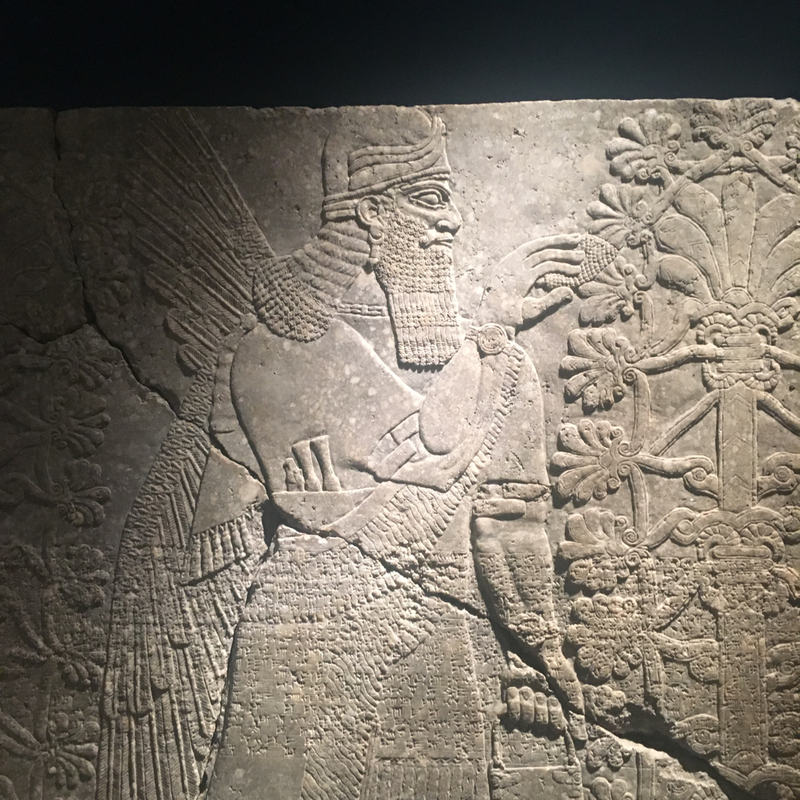 The Assyrian heartland was in Iraq. At the time that Ashurnasirpal II built his palace, the Empire’s territory also included areas of Turkey and Syria. Later military conquests expanded their territory into: Lebanon, Israel/Palestine, Jordan, Egypt, Iran, Kuwait, Saudi Arabia, and Cyprus. Is there a reason why the calf muscle is carved like that? I'm not completely sure what my question is but I've never seen muscles carved like that. It was done in that way to communicate strength. 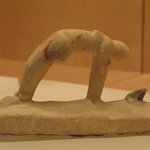 The Assyrians valued physical fitness and physical strength. The calf provides a large venue to detail the muscles. If you look at some of the smaller carvings they are also less detailed than larger versions. 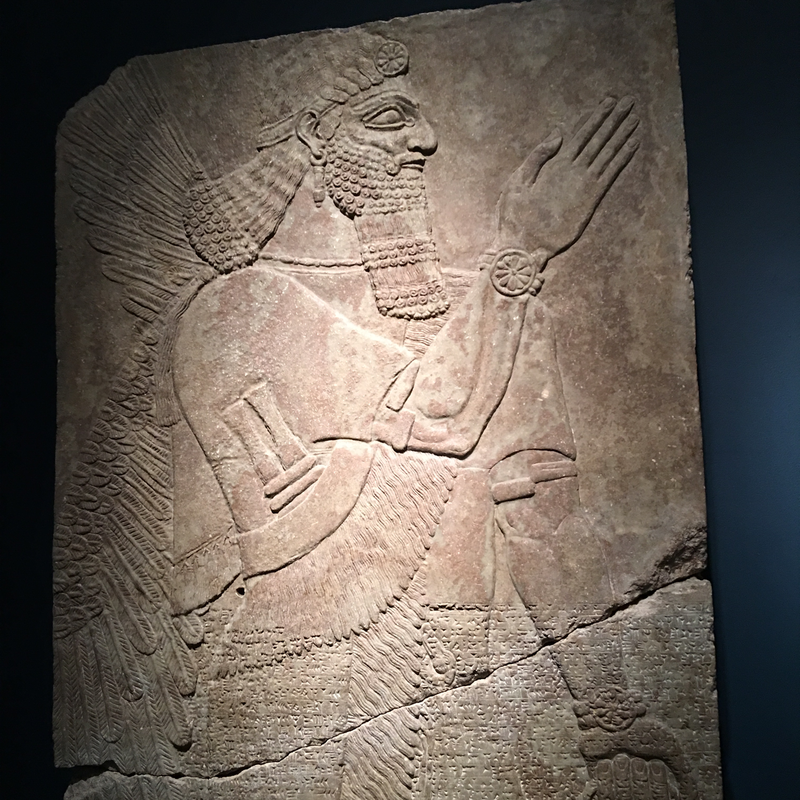 Interestingly, images from the reign of Ashurnasirpal II (the king who commissioned these reliefs) demonstrate the most defined musculature in Assyrian art history. 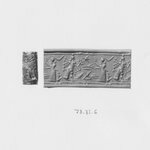 Are these reliefs originals? Where do they come from? They are! 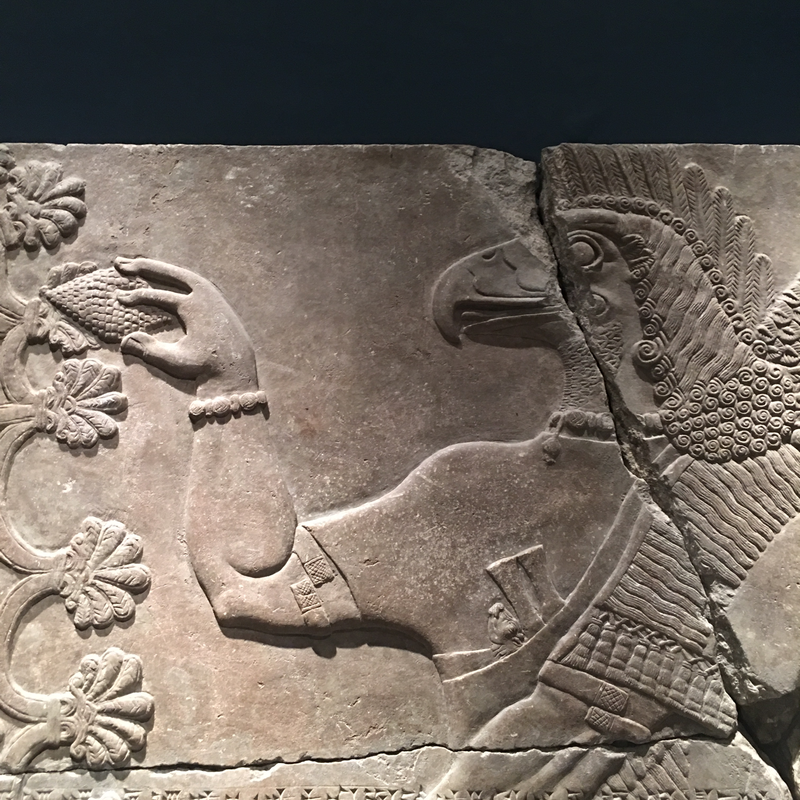 These reliefs (along with hundreds like them) were excavated from the Northwest Palace at a site called Nimrud which is in modern Iraq, near Mosul. Today, reliefs from this palace are in about 50 collections around the world. The British Museum funded the excavation of the palace in the 19th century, but there was too many finds for them to all stay in London. 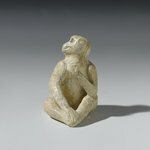 An art dealer bought these twelve in London to sell in the US where they ended up in the collection of the New York Historical Society from where we acquired them! I know that there are different forms of art such as painting and sculpture, but I don't know if I should call this a sculpture or a different name, please enlighten me. This does fall into a loose definition of sculpture, but more specifically it's called relief. Originally, all of these reliefs would have been brightly painted as well, so they would have been a combination! How many reliefs are part of this series? Hundreds! The twelve reliefs we have on view from the Northwest Palace today are a fraction of the original number. Stone reliefs were placed on most of the palace's walls and the entire building covered 6 acres! The Palace, which was built around 2,800 years ago, was excavated by a British diplomat in the mid-nineteenth century. 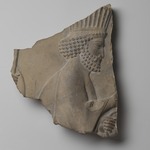 These reliefs were among the many excavated at the time, which can be found in museums across the world today (as well as still at the Palace). Why aren't these under glass? 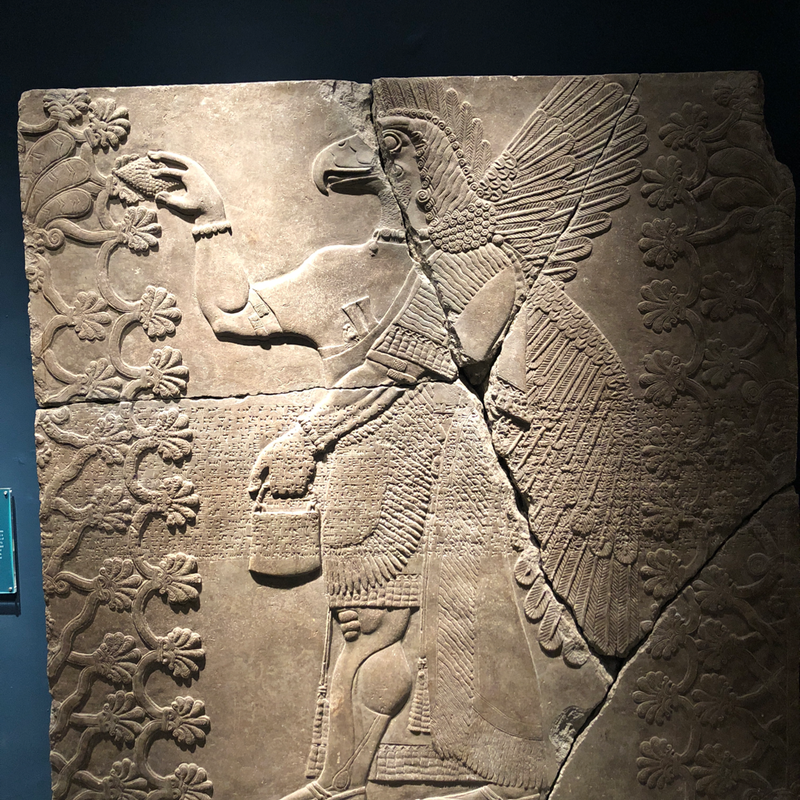 The Assyrian reliefs are relatively stable and the museum is willing to take the risk of having them not under glass so that people can enjoy them without any obstruction! What was the purpose of these reliefs? These reliefs were meant to serve as a visual showing of the king's power, so a propaganda tool. The reliefs would have been placed into the walls of the palace, so anyone visiting would have seen them. The inscription talks about how powerful the king was, the extent of his empire, his military victories, his ancestors, and the construction of this palace. 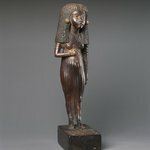 What are some similarities between ancient Near Eastern and Egyptian art? I think some similarities lie in the ways in which human figures are depicted, idealized and powerful in many cases. The art was meant to tell the viewer something specific. There was also a lot of contact between the two cultures. They were two major powers in the region and were in contact for trade and diplomacy. About two hundred years after the Assyrian Reliefs we have here, the Assyrians even gained control of Egypt. 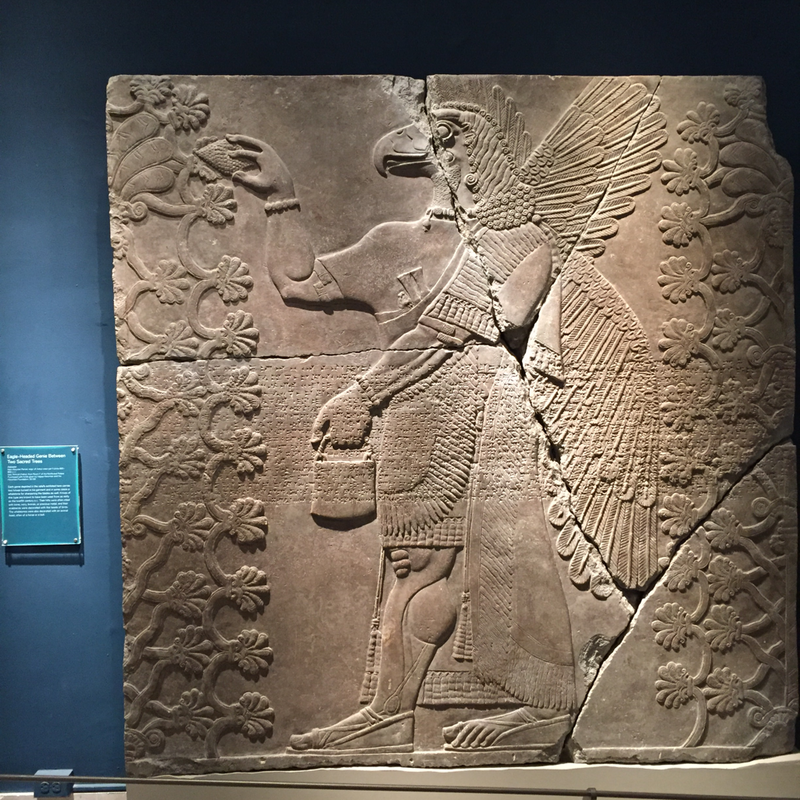 Do you know the timeline out of them both, were the Assyrian reliefs made earlier than the Akhenatan relief? Did they make the reliefs in a similar way? The relief of Akhenaten is several centuries earlier, actually! It dates between the years 1352 and 1336 BCE. 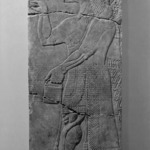 The Assyrian reliefs are from 883-859 BCE. Relief carving hasn't changed greatly over time. 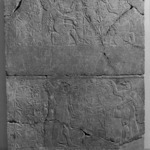 One of the main differences between these two is that the Akhenaten relief is incised, which means they cut the relief into the stone, while the Assyrian relief was made by cutting away the stone around the figures. Thank you! You have been great help! 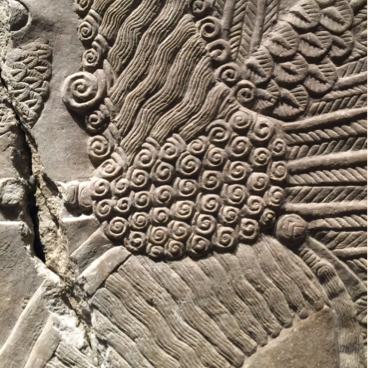 Who made the Assyrian reliefs? We do not know the names of the people who produced these works. 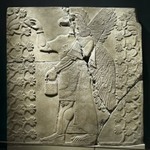 They were created by a series of Assyrian artisans who first drew the designs on the stone, second carved the scenes. Another group wrote the inscriptions, and then someone else carved them. Finally, the reliefs were painted, but the paint did not survive. What period and culture would these be considered a part of? The culture is Assyrian, the Assyrians are from Mesopotamia or modern day Iraq. 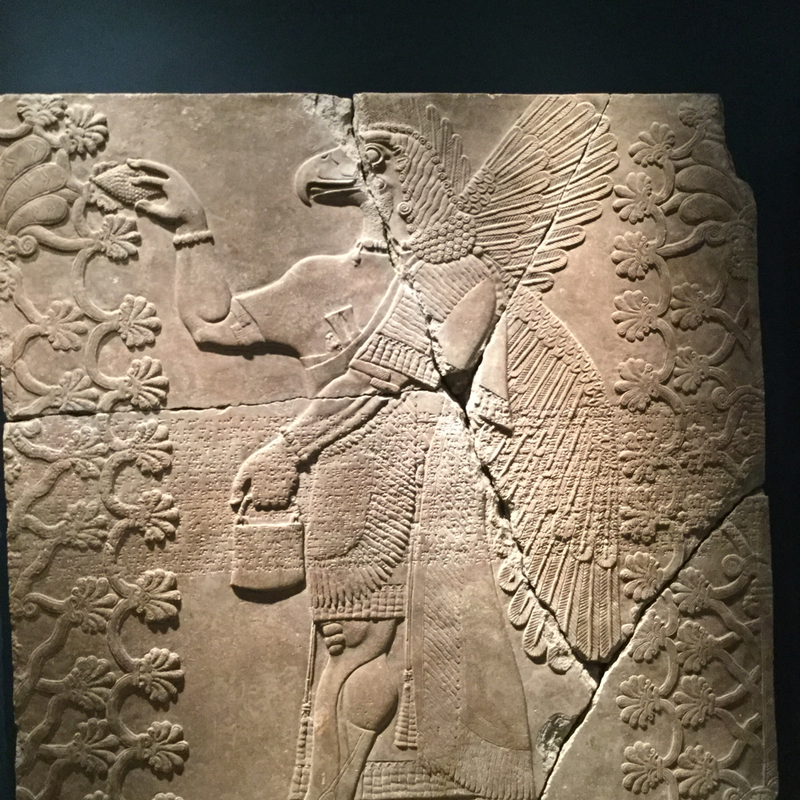 They originated in the city of Asshur and their empire expanded from there; these reliefs come from the city of Nimrud when the king Ashurnasirpal II made it his capital. As far as period goes: this dates to the Neo-Assyrian period in Assyrian history. 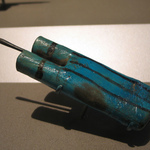 This would also be considered the Iron Age in Mesopotamia and the Mediterranean. ¿Este mural se que cuenta una historia sobre los dioses de la Mesopotamia? ¿Qué idioma es? 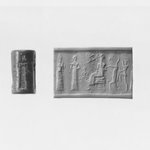 El texto es una historia que habla del rey de Asiria en el tiempo, Ashur-nasir-pal II. La idioma es el Akkadian. 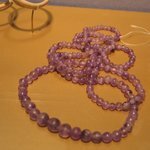 Se escribe con el sistema de escritura cuneiforme. Las imagenes son una metáfora para la reproducción y fertilidad usando la imagen del corno de abeto. Este mural estaba dentro del palacio del rey. ¿Cómo se lee, del borde superior? Se lee desde la derecha hacia la izquierda, como la mayoría de las lenguas semíticas. I was curious what type of stone this is made out of? The reliefs are carved from alabaster. The Northwest Palace was actually located very near a source of gypsum alabaster, which was used in these reliefs. They have weathered over time, leaving the grayish appearance we see today. Originally they would have been painted. Oh very interesting, thanks! Would have been fascinating to see them painted. The writing system is cuneiform! It's one of the oldest in the world. Can you read it? I would love to know what it says on this particular piece. Also, what are the other oldest written languages? I can't personally read cuneiform but there are scholars who can. Each panel has the same inscription, which has been translated. The text is quite long and talks about the king's ancestry, his military prowess, and the construction of the palace. Part of the translation reads, "I am Ashur-nasir-pal the obedient prince, the worshiper of the Great Gods, the fierce dragon, the conqueror of all cities and mountains to their full extent, the king of rulers who tames the dangerous enemies, the [one] crowned with glory, the [one] unafraid of battle, the relentless lion, who shakes resistance, the king of praise, the shepherd, protection of the world, the king whose command blots out mountains and seas..." Some other old languages include Egyptian, which you can find examples of here today, Chinese, and the script used in the Indus Valley civilization, which has yet to be really translated. Why is there writing across the central portion on each piece? The writing served as one method of showing the king's power and importance to visitors to the palace. 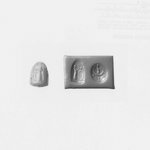 To me, it looks as if the inscription was rolled across the reliefs like a cylinder seal, a type of seal device common in ancient Mesopotamia. Would visitors to the palace be able to read the inscriptions on these reliefs? Were they literate? Very few visitors would have been literate. 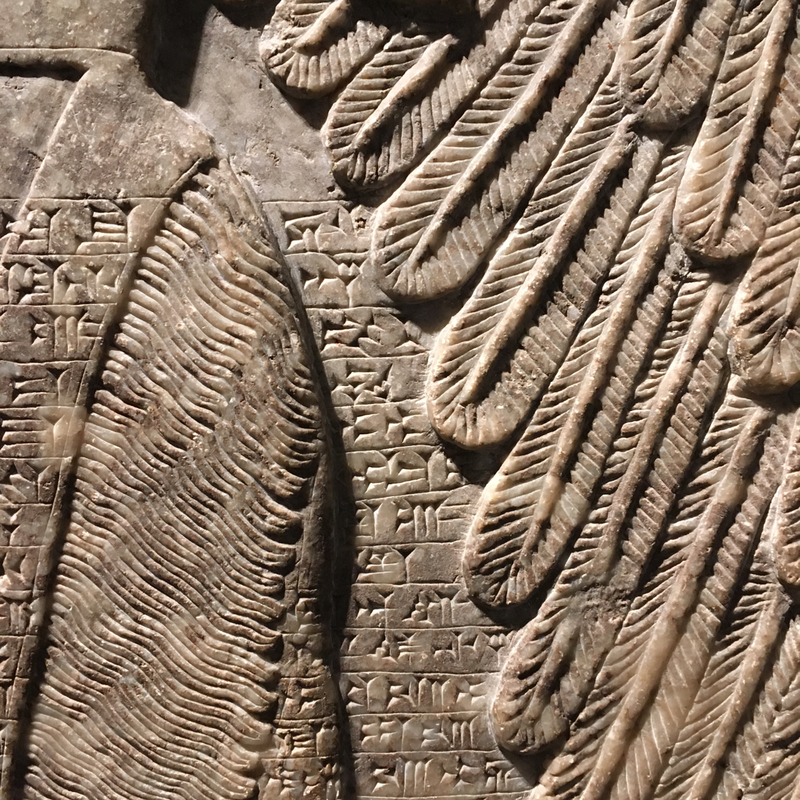 This particular language, Akkadian written with the cuneiform script, was the language of diplomacy throughout the Eastern Mediterranean, so visiting diplomats and envoys from other courts would have had some knowledge of it. For example, we know that documents in Egypt used Akkadian when sending missives! It's hard to know exactly how many people were literate, especially those who weren't part of the societal elite and the courts. On that level, sometimes the presence of that much text can have an impact, too! That's very cool. What is a missive? Missives are official letters, sent, for instance, from one king to another. The ancient world was a very connected place, as trade was a key aspect to life! Do you know where I can find a full copy of the text? Perhaps in a book or on a website? A full translation can be found in a book the museum published in 1976 by Samuel Paley. 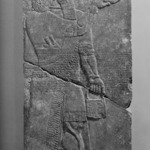 It is titled "King of the World: Ashur-nasir-pal II of Assyria 883-859 BC." The book can be found in libraries including the New York Public Library. How much do each of these things weigh? The twelve we have here range in weight from 1900 to 4500 pounds! The reliefs are carved from slabs of gypsum alabaster. The site of the palace, at Nimrud, was actually located near the site where they quarried the stone, so they didn’t have far to travel. Wow thanks. They look crazy heavy! How did this survive 3000 years? The dry conditions of the desert and the fact that this was likely buried under layers of sand, protecting it from the elements, allowed this relief to survive for 3000 years! 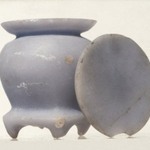 This combination of conditions is actually how many of the objects we have from the Near East have been preserved. The inscriptions in the center are actually in the Akkadian language, written with symbols called cuneiform. These panels were all part of the king's palace. Es original esta tesela y las demás piezas que hay en la sala? Si son originales. La clima del desierto y la falta de luz, los preservaron pero ha habido algun deterioro. Por ejemplo, originalmente, habrian sido pintados los estelas. Why do the genies have wings? 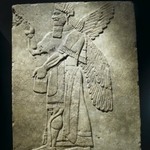 It was the way genies were typically depicted in the ancient Near East during this time. As supernatural beings, it was one of their physical characteristics. The wings also help them to be separated from human figures in the composition. 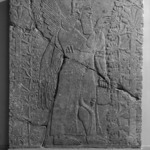 The only figure without wings on these reliefs is the King whose palace these reliefs adorned, Ashurnasirpal II. Another fun fact is that these genies should be understood to have four wings, with another pair on the side of the body we can't see from this vantage pint. 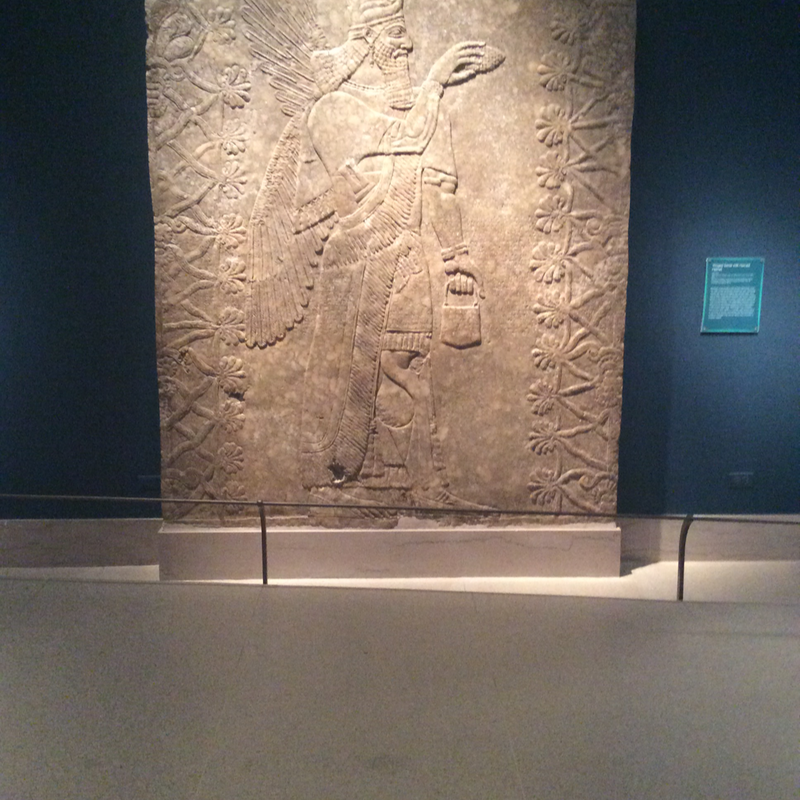 The wall relief you sent if Assyrian in origin. 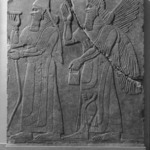 The Assyrians originate in Iraq and predate Zoroastrianism. 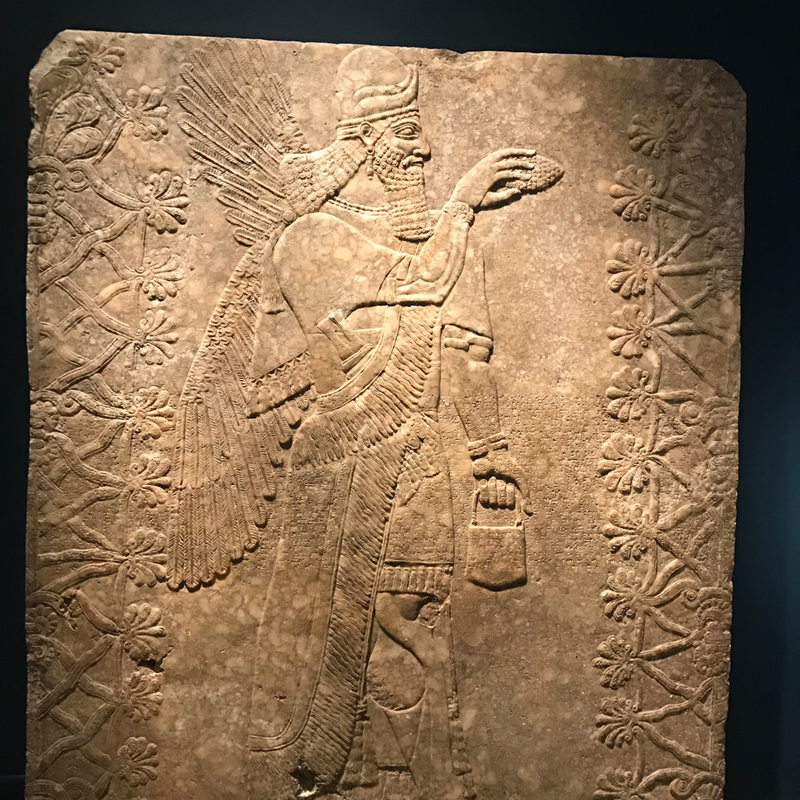 The Persians, who practiced Zoroastrianism, did adopt many of their artists motifs from the surrounding cultures, mostly Elam, but also Assyria. 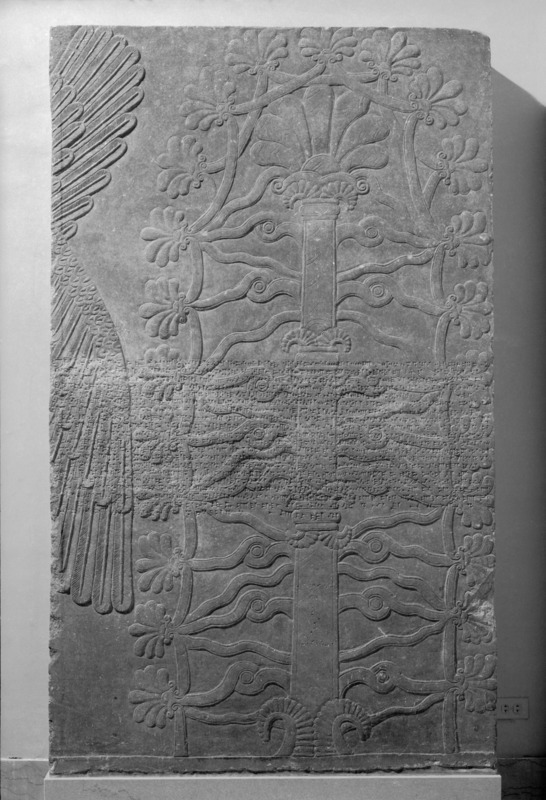 If you look closely at some of the reliefs, you'll notice the same kind of winged sun-disk which came to represent Ahuramazda, but it is originally a much older symbol. 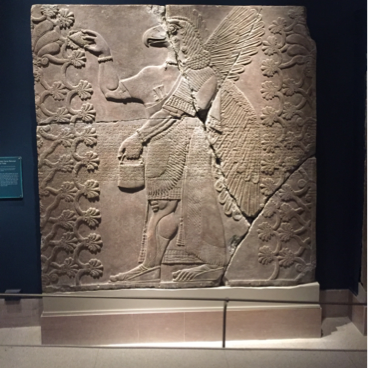 What is the Neo-Assyrian period? 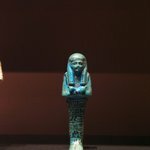 Why is it found in the ancient Egypt section of the museum? 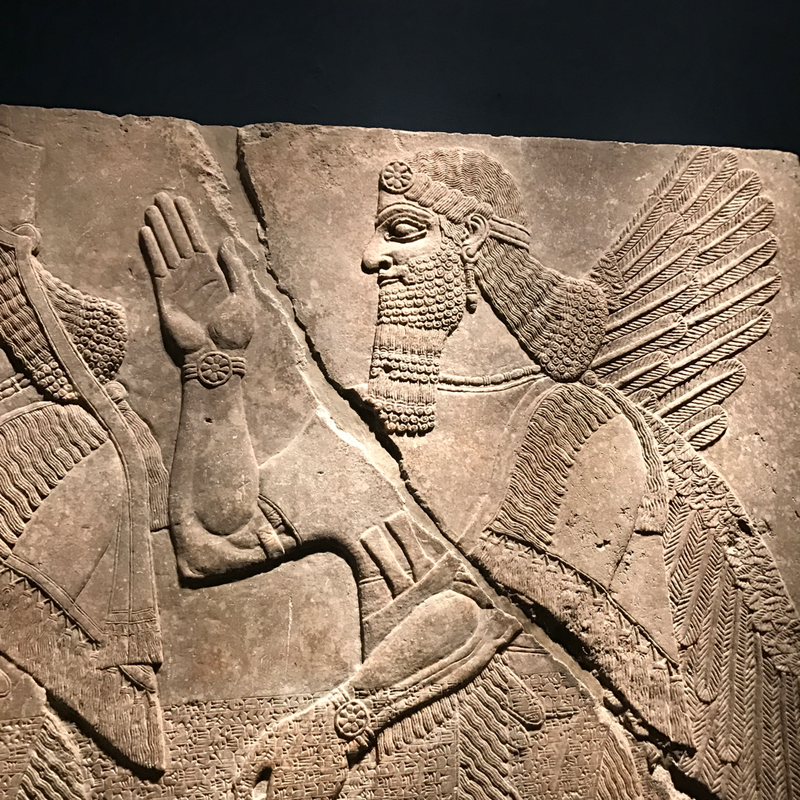 The Neo-Assyrian period refers to the third time the Kings of Assur created an empire out of their neighbors, the first two are referred as the Old and Middle Assyrian periods, respectively. The Assyrian people originated in the city of Assur which would be in modern day Iraq and, during this period, expanded their territory beyond Mesopotamia to include the Levant, Anatolia, and even Egypt. 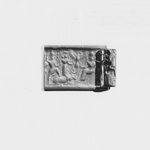 The gallery that you are in right now is actually called The Hagop Kevorkian Gallery for Near Eastern art, which is why pieces from several different Near Eastern cultures appear. The term “Near East” refers to the vast expanse of land extending from the eastern Mediterranean coast to central Asia so it's actually right next Egypt in reality as well. Why are there so many images of the same thing? What is the intended effect? Great question! Repeated plan imagery emphasizes the fertility concept. 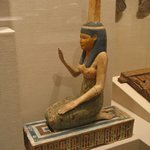 In the Egyptian galleries you may also see (albeit rendered very differently) plant imagery on funerary objects where plants also related to fertility and rebirth. 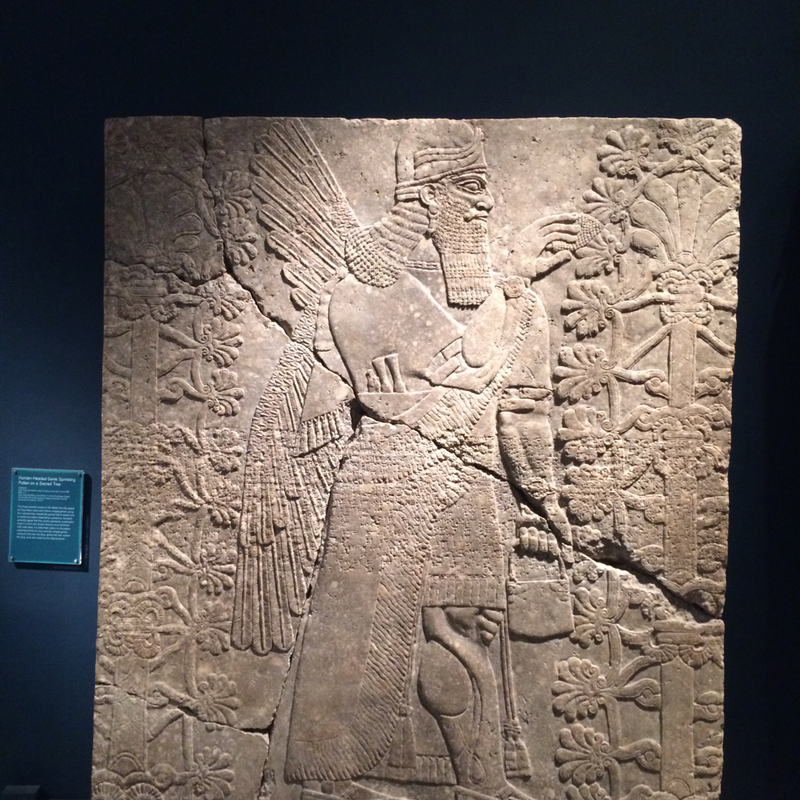 In these wall reliefs, Ashurnasirpal II intended to emphasize his role and a legitimate, powerful, and rightful ruler. Part of this included relating himself to the continued fertility of his lands. These are so elaborate! Where did they come from? These reliefs once decorated the palace of the King of Assyria, Ashurnasirpal II, which was in Nimrud, near Mosul, in Iraq. They are carved into gypsum alabaster that would have been brightly painted. Most of the figures, the ones with wings, are genii. 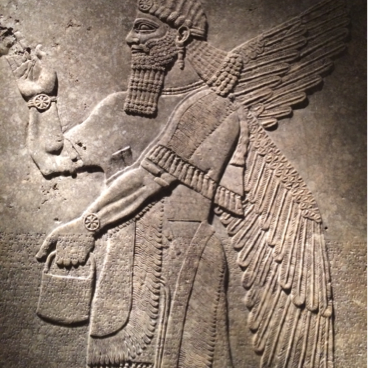 You can find the depiction of Ashurnasirpal II by looking for the only figure without wings. The plant that each of the figures is attending to is a stylized version of the sacred tree, a symbol of fertility. This was a concept essential to the continued success of the king, his kingdom, and people. 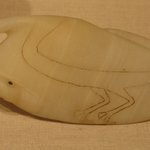 How hard is alabaster to carve to produce such fine lines and patterns? In other words is there a particular reason why it was chosen vs another material? 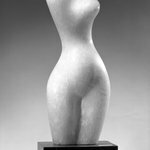 Alabaster is a finely grained stone that is actually known for being delicate and fragile. It is soft so carving fine lines isn't particularly difficult. 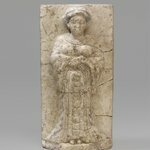 As for why these reliefs were carved in alabaster, the material was popular and common in the ancient Near East. It was one of only a few locally available resources, in fact! 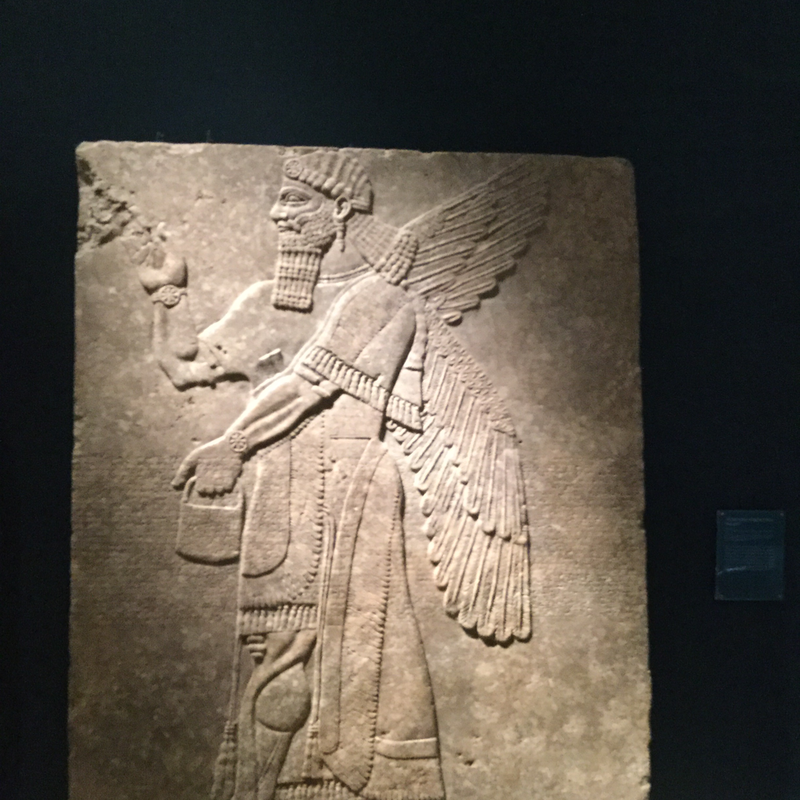 Nimrud, the location of this palace, was close to several sources of the material. 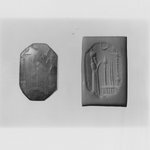 Do these reliefs have the same provenance as the ones at the Met—through Layard and the British Museum? The reliefs are from the same palace, yes, the Northwest Palace at Kalhu constructed under King Ashurnasirpal II. Both were excavated by Layard, but the middleman was different. 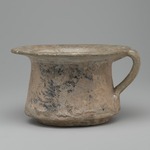 The Brooklyn museum purchased them from James Lenox of the New York Historical Society, while the Metropolitan Museum's group changed hands several time and was eventually gifted by J.D. Rockefeller. 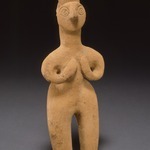 What is this figure are holding? Our guesses are pinecone or beauty blender. I love the beauty blender idea but the pinecone guess is closer. They are fircones that the genii are using to pollinate the sacred palm trees. You're welcome! The tree itself is a symbol of fertility and the continued success of the king and his kingdom. 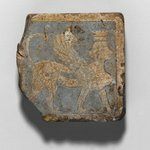 These reliefs came from an enormous palace and would have originally been brightly painted! These people are as tall as me: 6"6. Was this their real life size or were the images created larger to appear more God like? I think you are absolutely correct, that their large size was intended to convey their divine nature. People, on average, were shorter in ancient Mesopotamia than they are now. 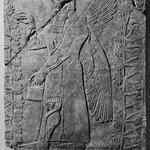 These reliefs decorated the palace of king Ashurnasirpal II and essentially served as propaganda for the crown. The large size emphasizes the king's power! Thanks for the extra story! Does this pattern on the reliefs mean anything? Yes it does! It is the Akkadian language written in the cuneiform script. Most panels show, basically, the same inscription, called the Standard Inscription. 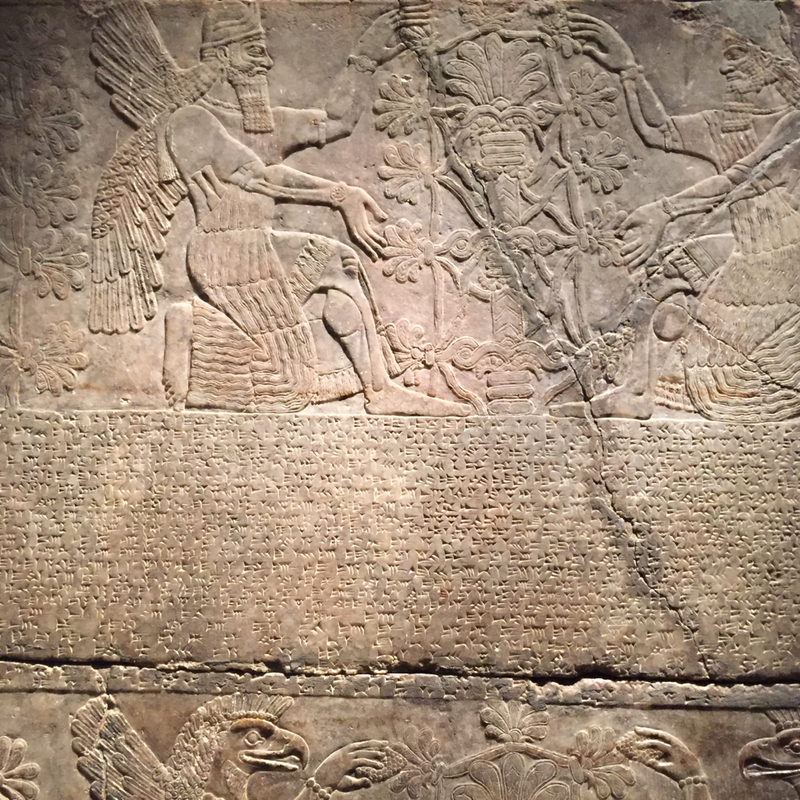 The text describes the Assyrian king, Ashurnasipal II's lineage and recounts his accomplishments. 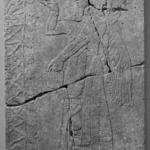 These reliefs decorated his palace and the text and the images combined would have served to reinforce his legitimacy as king and status as a divine leader. 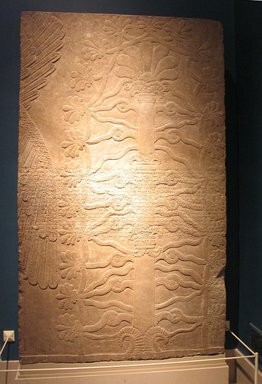 One of the descriptions talks about the Sacred Tree being related to Ishtar - do you know if that is from the myth of the Huluppu Tree with Inanna or is it from something else? The Sacred Tree referenced here is a little more broad in concept. Throughout ancient Near Eastern cultures (Assyria, Babylon, Sumer, Phoenicia, Cyprus, Canaan, even Egypt in some capacities) there is the concept of a Sacred Tree that is a symbol of fertility and the feminine. I'm glad! Trees could be read as a triumph of fertile land and a tree that grows in the desert is seen as a miracle. 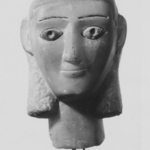 Ishtar's ties to the broad concept Sacred Tree are based on her role as fertility deity. I noticed some of these have big cracks in them, how are they held together after all these years? We have a conservation team here at the Museum who, among MANY other things, make custom designed mounts especially for antiquities like this. I believe there is also some mild adhesive in the cracks to help keep the slabs steady. Basically, they carefully installed and supported so that they can be viewed in their full glory! 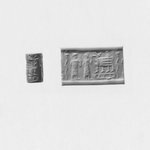 Which is the older system of writing: hieroglyphics or cuneiform? 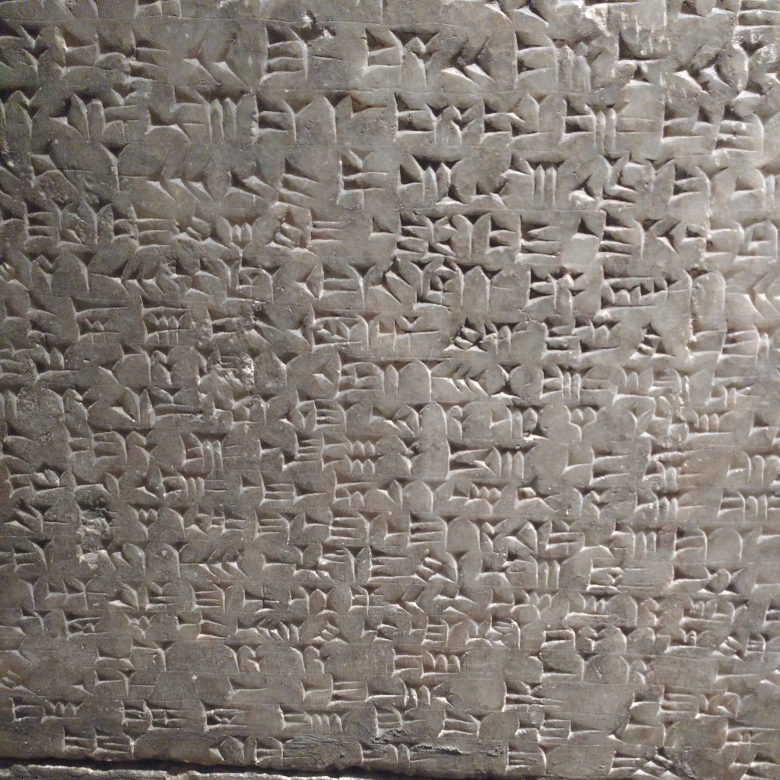 Although they developed around the same time, cuneiform is often considered to be the older of the two. 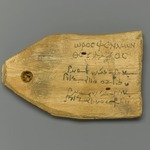 But this is just based on what we know from the archaeological record and dating surviving inscriptions from the time. That's a good question! The palace of Asurnasirpal II was rediscovered in 1840 by Austen Henry Layard, an English Diplomat. He discovered the site accidentally while traveling the Tigris river, he first noticed a mound near the riverbank and discovered it to be rich in antiquities. He returned five years later with the British Museum and local scholars including Hormuzd Rassam to excavate to site. ¿Este mural se descubrió en la vieja Mesopotamia, donde ahora es Irak? Sí, se descubrió en Irak. 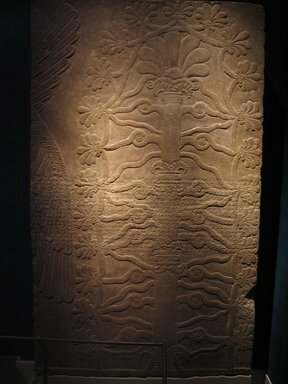 The sacred tree is one of the oldest themes in ancient Near Eastern art. Some scholars have suggested that the sacred tree symbolized life; others interpret it as a symbolic representation of the king. The earliest depictions of the sacred tree were naturalistic. 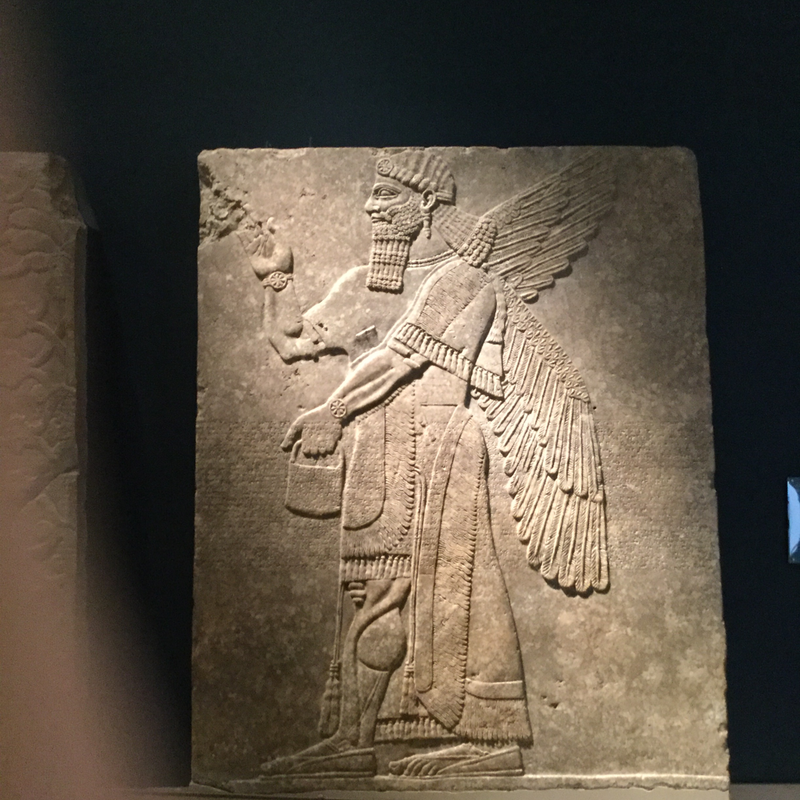 Later artists, including those working for Assyrian kings, favored forms that seem more ornamental than real. 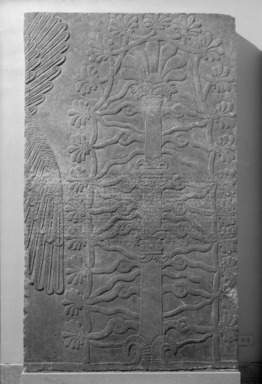 The palmette at the crown of the tree has been interpreted to represent the frond of a date palm, and the tree itself is associated with the goddess Ishtar, a fertility deity and goddess of the date harvest.